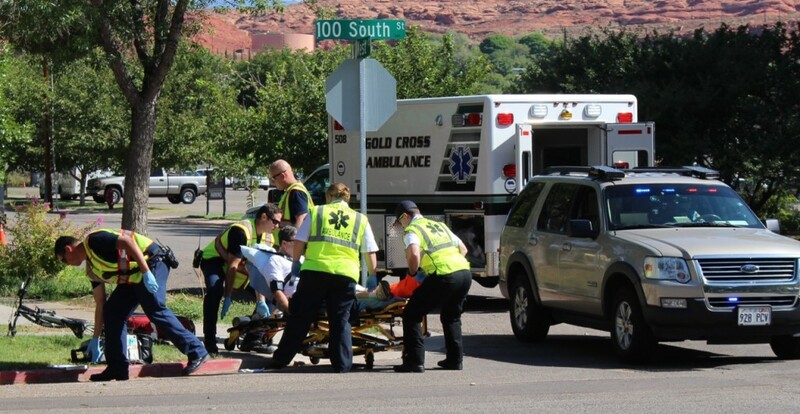 ST. GEORGE – A collision between a bicycle and a vehicle Thursday morning left the cyclist injured, and prompted police to remind bicyclists to obey traffic laws. 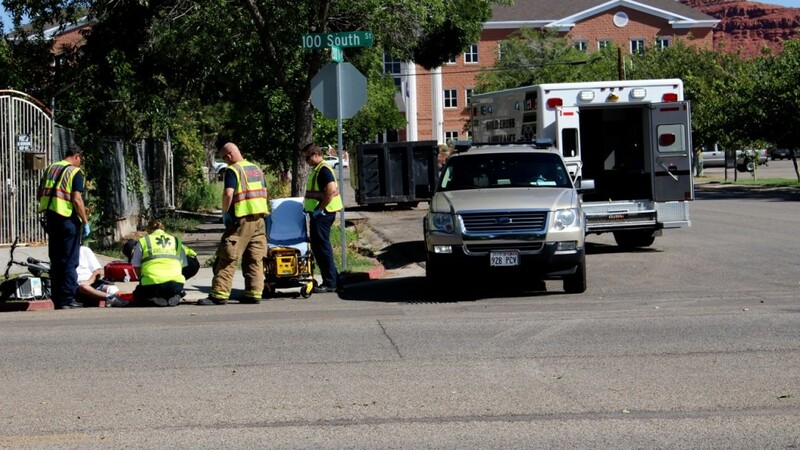 The accident occurred around 10:30 a.m. at the intersection of 100 South and 200 West in St. George. A bicyclist was traveling eastbound on the north side of the road against traffic on 100 South, approaching the intersection with 200 West, St. George Police Officer Tyrell Bangerter said. A Toyota Avalon was southbound on 200 West, and had stopped at the stop sign. The male driver looked both ways for traffic and then started to make a right turn. “The bicyclist saw him stopped at the stop sign and thought or hoped that he could make it past him,” Bangerter said. The driver of the Toyota did not see the cyclist, Bangerter said, and struck him with the front bumper of the car. The cyclist had a skinned up knee and an injured ankle, and was transported to Dixie Regional Medical Center in St. George. The Toyota had minor damage to the front bumper. The cyclist will be issued at least one citation for traveling on the wrong side of the road against traffic, Bangerter said. 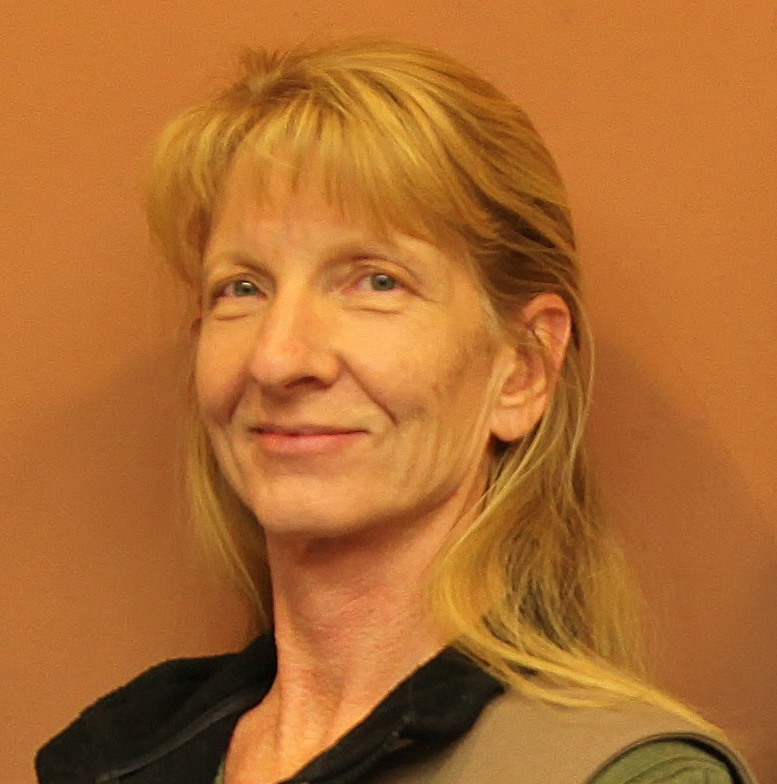 The officer said the Police Department is seeing a lot of auto-bike crashes recently, and a lot of them stem from bicyclists not operating where they need to be operating. 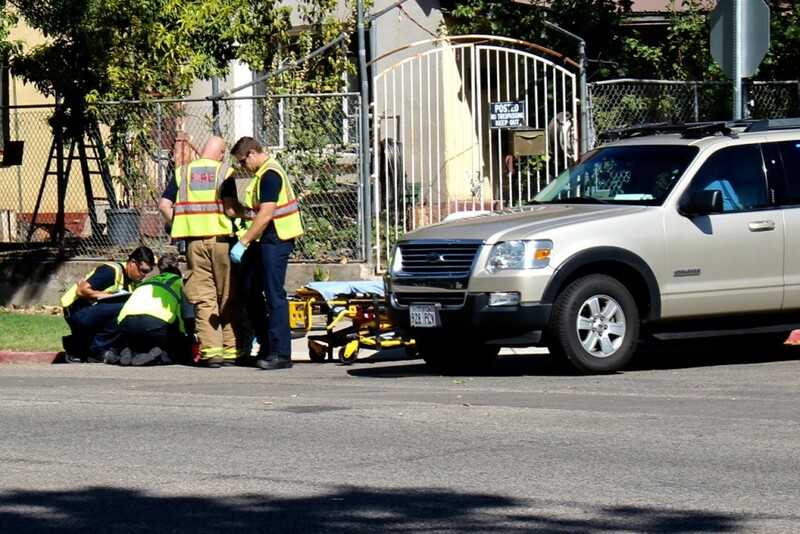 Luckily the cyclist’s injuries were relatively minor, Bangerter said, but there is the potential for serious injury, noting that when a cyclist meets a 3,000-pound car the odds are against him. 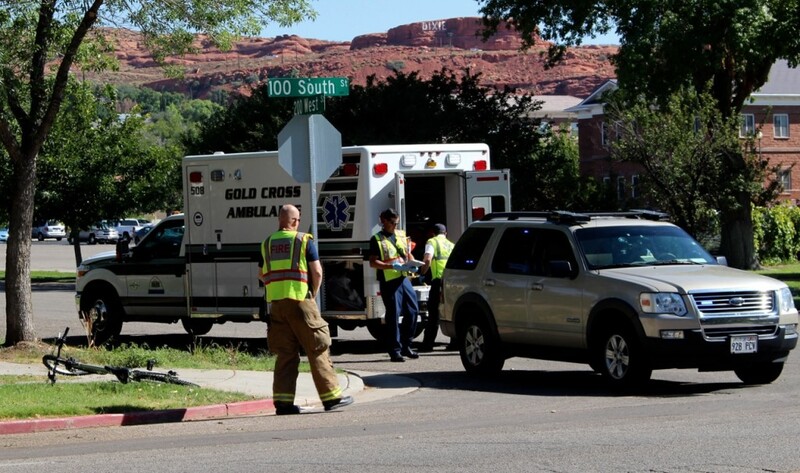 The St. George Police and Fire departments and Gold Cross Ambulance responded to the accident. Posted in NewsTagged 200 West, Accident, auto-pedestrian, bangerter, bicycle, crash, cyclist, St. George Police Dept. 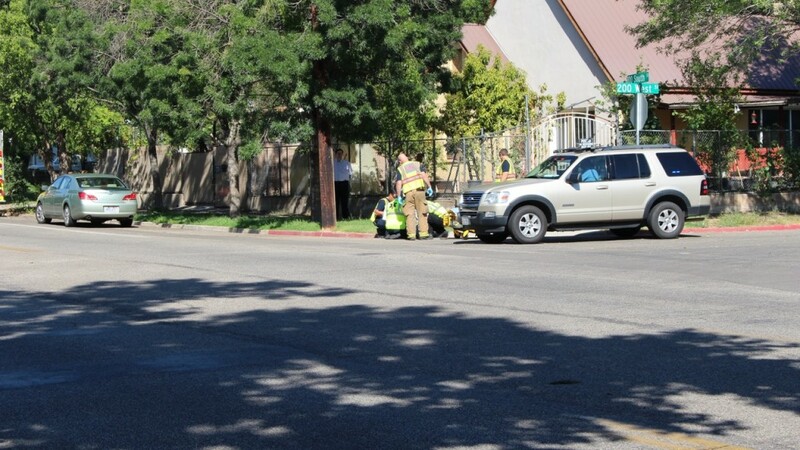 Another bicyclist caused an accident, what a surprise. I ride my bicycle to work every day, and while it is a short ride, sometimes it is a very dangerous ride. People really need to pay attention. God bless. I always ride my bike on the sidewalks and I don’t care if its illeagal, if a pedestrian is on the sidewalk I always will pull over and get out of the way. I do not care if I get a citation and will pay the fine. Anyone that thinks they have equal rights when they ride a bike on the roads with traffic in Saint George, Is totally trying to collect on a life insurance policy or on drugs. 1. Bicyclists don’t know the rules of the road. They think that becaase they are not operating a motor vehicle, they are the same as pedestrians and can ride on the sidewalk or against traffic, for example. Bicyclists need to learn and understand the rules of the road and be vigilant of other drivers. 2. Most St George drivers are so absorbed in themselves and what is going on in their lives that they think that nothing bad will ever happen to them so they see nothing wrong with operating a 3,000lb motor vehicle at high speeds while texting someone, calling others, reading something, putting on makeup, eating McDonalds and drinking Kool-Aid as they tail gate the person in front of them because they are late for work, or church. Drivers need to realize that they are not any better then anyone else, that bad things can happen to them (and will if they are stupid), that text message can wait, the book will be there, makeup can be touched up in a bathroom, you can eat on your lunch break, and you might be 3-4 minutes late for work now but you won’t make it at all if you get into an collision. Wow no comment from the REAL LIFE VILLAGE IDIOT. ?